Kjenstag Ruins is an outdoor ruin east-northeast of Morthal, southwest of Hjaalmarch Stormcloak Camp. Is a circular ruin with an arched entrance to the north. Inside there is a short central wall with an empty stone table in front and an adept locked wooden chest behind. It is possible to climb to the top of the walls via the southeast where it has partially crumbled or to the west by climbing a rock formation and jumping from there. However, apart from the view there is nothing of interest up there. There are also no harvestable plants in the immediate vicinity. 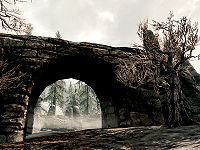 Upon approaching the ruins at night, an unnamed ghost will run from the entrance, leading you to an unmarked barrow just southeast of Hjaalmarch Stormcloak Camp. The grave site is being robbed by two bandits, one of which is carrying the Block skill book A Dance in Fire, v2. The barrow itself is a spiral staircase leading down to a sarcophagus containing a mummified draugr and three items of leveled loot: a weapon, a necklace, and a shield. The ghost only appears once.